This High-Level Side Event aimed to share challenges of desertification that the Sahel and the Horn of Africa countries are facing and discuss how the countries and development partners can work better to address desertification issues and strengthen resilience to climate change. 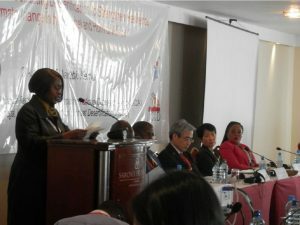 It was held in Nairobi on 27th August 2016, and co-organizers of AI-CD, together with the representatives of African countries, international and regional organizations, development partners, the private sector and civil society attended. A new initiative, “African Initiative for Combating Desertification to Strengthen Resilience to Climate Change in the Sahel and the Horn of Africa”, was officially launched at this event.